To peruse your Samsung Galaxy Note 3’s address book, open the Contacts app. You may find a shortcut for this app on the Home screen; otherwise, look for it on the Applications screen. 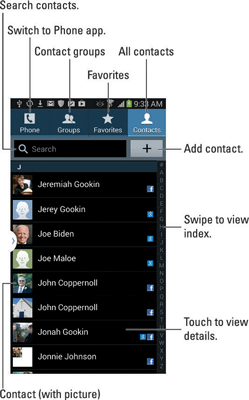 You can also view your contacts by touching the Contacts tab in the Phone app. 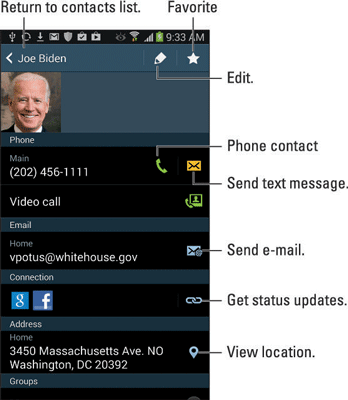 The following is an example of the Contacts app. Try to locate the items illustrated on your Galaxy Note’s screen to familiarize yourself with the app. Scroll the list by swiping your finger. You can use the index on the right side of the screen to quickly scroll the list up and down or to hop to a specific letter of the alphabet. To do anything with a contact, you first have to choose it: Touch a contact’s name on the screen, and you see more information. Place a phone call. To call the contact, touch one of the contact’s phone entries, such as Home or Mobile. You touch the entry itself or touch the Phone icon by the entry. Start a video call. Contact the human using both voice and video. Send a text message. Touch the Text Message icon, to send the contact a text message. Compose an e-mail message. Touch the Email link to compose an e-mail message to the contact. When the contact has more than one e-mail address, you can choose to which one you want to send the message. View social networking info. To see the latest status updates for a contact, touch the person’s social networking icon. Locate your contact on a map. When the contact has a home or business address, you can touch the little doohickey next to the address, to summon the Maps app. Oh, and if you find birthday information for a contact, you can view it as well. Singing “Happy Birthday” is something you have to do on your own. When you’re done viewing the contact, press the Back button. Information about your contacts is pulled from multiple sources: your Google account, the phone’s storage, and your social networking sites. When you see duplicated information for a contact, it’s probably because the information comes from two or more of those sources.